The International Association of Facilitators (IAF) and SessionLab have partnered up to bring the IAF Methods library with its hundreds of reviewed facilitation methods into the state of the art session design tool and facilitation library of SessionLab. What is the IAF Methods library? The IAF Methods library is a set of facilitation tools and techniques collected and curated by IAF members. Part of the library is public to help facilitators to promote the power of facilitation worldwide, while the other part is for members only. Get full access to the IAF Methods library. The IAF welcomes everyone with an interest in facilitation and its widespread use in helping people work together effectively. By joining IAF, you will get access to more than 500 members-only facilitation methods in the library of IAF. See more about why else you should join IAF. Sign in to SessionLab with your IAF account. If you are an IAF member, you can easily connect your IAF account with SessionLab. This will give you access to the full IAF Methods library. What else do I get when signing up to SessionLab? SessionLab is an online platform providing a dynamic way to design your workshop and collaborate with your co-facilitators and to draw on the collected experience of facilitators about what methods you can use. See features of SessionLab for more info. Experience why facilitators love it! How to connect IAF and SessionLab accounts? You can sign up for free SessionLab account. On the Sign up page select the button with IAF logo under the ‘sign up with’ section on the right. If you are already logged in to IAF website your SessionLab your account will be created. Otherwise, you will be redirected to IAF log in page, and after successful log in, your account will be created. We will use your IAF email address and user name for your new SessionLab account. You can change this information later in your account settings. After account creation you will be brought to SessionLab welcome page and will be able to start using all the SessionLab features. From then on you will be able log in to SessionLab using your IAF account by clicking on button with IAF logo under ‘log in with’ section on the right side of the SessionLab log in page. If you already have SessionLab account and IAF membership, including access to IAF website, you can easily connect the two account. Go to your SessionLab account settings and find the ‘Connect to IAF’ option under your picture profile. 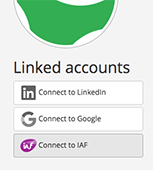 If you are already logged in to IAF website, the accounts will be connected directly and you will get a message of successful connection. Otherwise, you will be redirected to IAF log in page, and after successful log in, your accounts will be connected. After the accounts are connected you will also be able log in to SessionLab using your IAF account by clicking on button with IAF logo under ‘log in with’ section on the SessionLab log in page.